I have friends who are visiting Italy right now and I decided that the friends left behind should have some Italian fun as well. This past weekend we got together for wonderful Italian dinner. We made our own pasta, we drank Italian soda & wine and we had Lemon Gelato for dessert. This gelato was so easy to make. Everyone loved this creamy and refreshing Italian treat. Who needs Italy? Enjoy! 1. In a glass bowl, using a hand mixer combine creams and sugar until sugar dissolves. Stir in vanilla, lemon juice and zest. 2. Refridgerate the mixture for at least 2 hours. 3. Pour mixture into an ice cream maker and allow it to freeze. Follow manufacturer’s instructions. Freeze gelato overnight. Mmmhhh, fabulous! One of my favorite gelato flavors! I adore lemon gelato after a heavy meal, it cleans the palate so well. Nicely done. mmm...I bet that is so refreshing and delicious!! A perfect summer treat! It looks perfectly cream and delicious and it's LEMON!! This is going to be quite the treat on a hot summer day! oh, this looks awesome. I've only had lemon flavored sherbets/ices before...lemon gelato sounds so good! And what a mouthwatering pic. yum! it's no secret that my favorite desserts either involve chocolate or lemon. this would be totally refreshing right now! While on vacation in Italy, my cousins treated me to gelato each & everyday... and lemon was my all time favorite! Looks so good!! I love gelato! You make it seem so simple to make, so I may have to try it this summer. YUM! OMG! I Want this. It needs to be mine. It sounds FABULOUS, yes it deserves capitals. I think my husband would kiss my feet if I made this for him. He loves lemon. This gelato sounds so perfect right now on a hot day when I just came back from a playground with my daughter. YUM. I love gelato. That looks amazing. D-girl, I think the addition of Lemoncello and some Savioardi biscuits would have made this most decadent. Still, you made it - tis wonderful. Looks so melty and delicious! It is 34 degrees out here today, so I could use something this refreshing! Yum! I love gelato! It looks fantastic and lemon is so perfect for summer! lemon gelato is one of the few things that I can eat. this looks great. You had me at "hello!" Gorgeous! Where is my ice cream maker...? Wow, 3 tablespoons of zest. I'll bet that took a while to get. Anyway, this looks fabulous and oh so creamy. I'm gonna have to try this! I've never had gelato, but it looks like an even more luscious version of ice cream. Delicious. Citrus anything is UP MY STREET Paula...totally yummy!Thanks for the treat, though virtual, I'm feeling cool already. It's lovely-so creamy & rich looking. Must have been fab with all the juice & zest! Is that biscotti I see peeping from behind? Oh that just looks so delicious. A refreshing dessert for summer! This looks amazing! 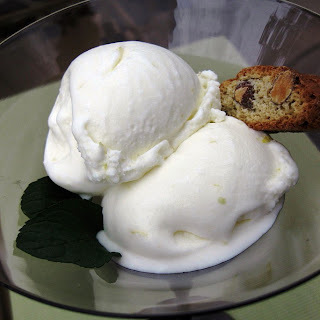 I love the refreshing taste of lemon gelato but have never tried to make it myself. Fatastic recipe! mmm lemon ice-cream! One of my favourite flavours. so refreshing! di-vine - definitely on my list for summer! I have such a thing for lemon gelato and ice cream. I now have a great recipe for the ice cream, courtesy my friend for whom I churned many, many litres for her daughter's party in Feb.
What a truly sweet gesture. Your friends are so lucky! Good friends and good food, that is life what should be. Your gelato look delicious! Yum!! I'm not a big ice cream fan but I'll have lemon gelato any time. Thanks for sharing the recipe. It's so easy. That's exactly what I need right now! It's so hot here, I'm suffering. That is so beautiful! I might make it for my BBQ this weekend. It will be nice and light after burgers. Lemon gelato sounds nice and cool and refreshing and good! Your gelato looks like it came from Italy good job. This looks perfect so summer! I love anything with lemon in, this looks wonderful! Thanks for posting this. Lemon gelato is a huge favorite of mine! I made the base this morning, it's been chilling for hours and I'm just about ready to get the ice cream maker going. The base tastes so good I can't wait to try the resulting gelato!! Mmmm so delicious! Husband and I both will love this. I just wrote down the recipe. I love when something so simple turns out so luscious! Just made this yesterday it was so good. Wish more people would comment on here that actually made the recipe instead of just saying it looks good or I should try this.